October is one of those months I look forward to most during the year. Not because the leaves are changing and I get to set out my pumpkin candles, but because I get to share my family's story all over again. 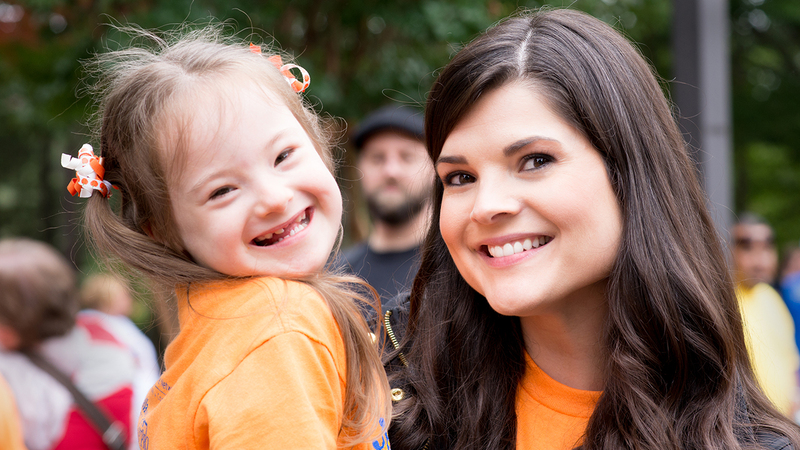 This weekend, I'm gearing up for the Triangle Down Syndrome Network's Buddy Walk Fundraiser, a cause that's very personal for me. You see, I'm a big sister to a little girl with Down syndrome. Her name is Cassie, and she came into our lives 7 years ago. My mother will tell you she never expected to have a third child, and none of us were prepared to learn she would be born "different". Boy, was it life changing! Down syndrome is a rare genetic condition. Only 6,000 babies in the country are born with it each year. Today, there are more than 400,000 people with Down syndrome living in the U.S. Most people with the disorder have cognitive delays that are mild to moderate. Many endure countless hours of therapy to improve speech and motor skills, but they eventually become active participants in their community and schools. With each new milestone, Cassie is growing, maturing, and teaching us life lessons about unconditional love and sharing it with others. In 2010, my family started Cassie's Crusaders to campaign for more awareness. Over the years, friends, co-workers, and even strangers helped strengthen our effort to fund local programs for families like mine. This year Cassie's Crusaders is about to reach our own milestone. We've raised nearly $10,000 for Down syndrome since we first started our journey. This weekend, my family is once again taking the long car ride to Raleigh from their home up north. Even though we're hundreds of miles apart, the Buddy Walk always brings us back together. It reminds us that while Cassie and others like her may look different, they're more like us than we often realize.